Yesterday someone posted a find in Google Maps of what they claimed was a cruise missile in flight over south central Utah captured in the satellite photo. I have to admit at first glance it appeared to be a missile (although I was pretty sure it wasn't a cruise missile from the looks of it). However, in Google Earth , if you zoom in closer you can see this is a jet airliner with dark colored wings. If you click on the thumbnail picture to the right here you will see a larger contrast-enhanced version where the wings are more visible. Not only that, but if you use the GE measuring took, the fact it is 90 feet long is a clue. Also, the pair of vapor trails shows it has two engines (a cruise missile only has one). There was a Digg on the find, and many commenters were quick to point out it was not a cruise missile. One commenter said the jet is an MD-90. 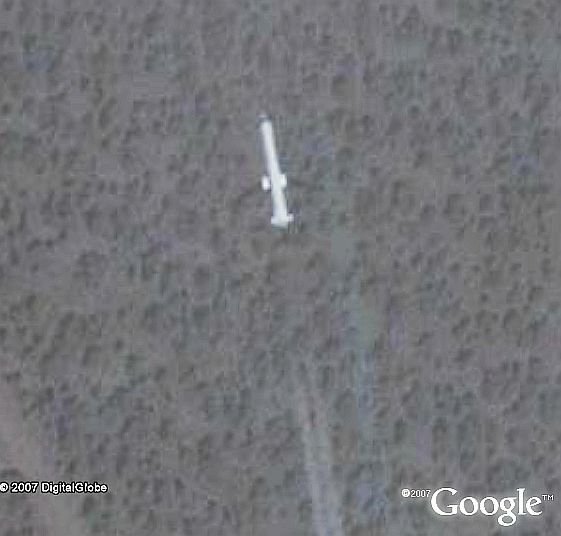 Over at the Google Earth Community, a lot of people posted the "cruise missile" find after the Digg. Hopefully this post can help spread the word about what it really is. Related: Finding planes in flight in Google Earth. How do you measure objects that are not on the ground? Using the measuring stick could be a little misleading, wouldn't it? I mean, the plane's probably a few thousand feet off the ground, while the measuring stick measures things on the ground. The measuring stick is still effective with measuring airplanes in flight. The reason is that the satellite is at least 100 miles above the earth. From that distance, the line of sight is essentially parallel between the plane and the ground. So, the measurement is still very close to correct. satellite or arial foto? And contrails are from the wings, not the engines. Yes there are wings and cruise missiles have wings. I don't know which one it is but it could be either. What are the white objects on either side of the plane about the middle? These appear to be a pair of engine pods. What plane has engines on top of the wings? I thought some of the pictures, especially the high-resolution ones, are aerial photos taken from an aircraft. And by looking at the contrails of the "cruise missile", I'll say that its flying higher than 30.000 feet. Anthony Kelly: Yes, the difference in size of the plane viewed from 96 miles is about the same as from 100+ miles where the satellite is taking the photo from. 20,000 feet just doesn't make much difference from those distances. Contrails can be made both by wing tips and engines. But contrails from wing tips are seen only on takeoff and landing. Long (look at the picture from far away) contrails are almost always seen on planes flying very high. To do some quick and dirty math, 100 miles is 528000 feet. The presumption is something at 528000 feet and something at 508000 look approximately same. According to significant figure math, if we only have 1 significant figure involved both numbers are essentially 5*10^5. With two significant figures its 5.1*10^5 versus 5.3*10^5. Perhaps more importantly, A tomahawk cruise missile (a rather large cruise missile) is, according to Wikipedia somewhere in the neighborhood of 6.25 Meters in length, which is 625 CM (625/2.54)/12~=20.5 Feet in length. When we compare: 91 Feet and 20.5 feet and then knock them down to a single significant figure, which is probably over estimating the precision of our instruments we get 9*10^1 versus 2*10^1 both resulting from 5*10^5. Now, I may have butchered the rules of significance arithmetic a bit, but you get the idea. Funny thing...if you follow the vapor trail of the missile (plane) back to 38 degrees 11' 11.06" N and 112 degrees 17' 16.31" W you will find something that looks like a missile silo. this is a missile because the length is approximately 23 like a SS-24, and the MD-90 is 46.5 length.